CoMac Machinery manufacture, install and service a wide range of reel to reel slitting and rewinding machines. 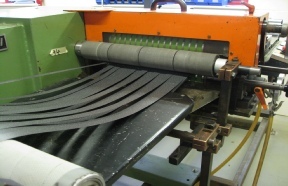 Our reel to reel slitting machines use static and rotary cutting techniques to meet all your requirements. Rewind machines can provide unwind and rewind operations and automatic guiding techniques for all your needs. CoMac Slitter Rewinding Machines, for reel widths from 20cm to 200cm, are economically priced solutions for splitting webs or fabric, paper, packaging, PVC and similar materials reel to reel. Machines can be basic for economy, or sophisticated when webs require a high level of control, or when lifting, loading and unloading needs to be facilitated quickly and efficiently. CoMac Machinery manufacture superior roller laminating equipment for all your laminating requirements. 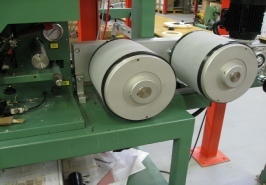 Our roller laminating equipment has been used in some diverse industries for a host of applications. • Surface frame lamination and profiles lamination. To discuss the Roller laminating equipment we offer please contact us and we will be more than happy to help. Flat panel laminating provides an even laminating pressure over the entire laminating process so the laminate will be bonded correctly to the product. 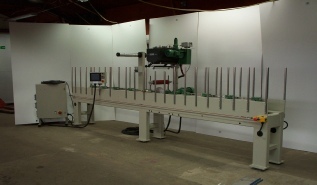 To discuss the flat press laminating equipment we offer please contact us and we will be more than happy to help. 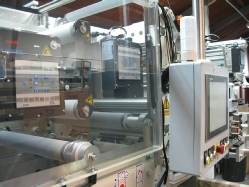 Linerless labels do not require a siliconised release liner, they are self-wound. Whilst these labels are applied almost exclusively to chilled meat packs, the application of this type of label could be widened to include other types of product and packaging. The absence of the liner reduces packaging costs significantly, it also reduces waste disposal costs. Recycling of the material has not been considered economically viable. Not only are material costs lower for linerless labels, the automatic application of labels, especially in Ravenwood applicators, is much faster reducing packaging costs even further. If you are interested in the Com500 machine please contact us and we will be happy to help.